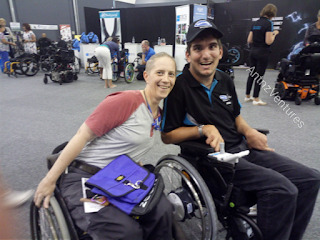 Yesterday I went down to the Show Your Ability Expo held in the Central Energy Trust Arena, Palmerston North. One of the biggest disability expos in New Zealand definitely had equipment there for people to thrive rather than just survive! Caught up with Jordon Milroy while I was there! The video for this event can be found here: https://youtu.be/efwyJ9qbsxw. Please turn up the sound so you can hear everything, we haven't figured out how to equalize it yet! A big shout out to David Guest from Show Your Ability and Brendon Stratton from RGK NZ & Lasher Sports for the interviews. A huge thank you to MJ for the super fast editing of this! 11 sec, Antnz (off camera): And this is just the first exhibit guys! It’s gonna be a busy day! Panning around Antnz (off camera): There is heaps here guys, um, last time I was here, 2016 there were a few gaps around the place. It’s gonna take me awhile to get all the way around, um, already had a burn on the mountain, downhill mountain bike with an electric motor, um at Melrose, but I’ll talk to you again soon. Scene change to downhill mountain bike. Antnz (off camera): Melrose, and they are crazy enough to let me a burn on this, I should bring it back in one piece! But um, Dominic, you’ve inspired me man and this could get dangerous on my wallet! 2 short scenes of Antnz on downhill mountain bike. 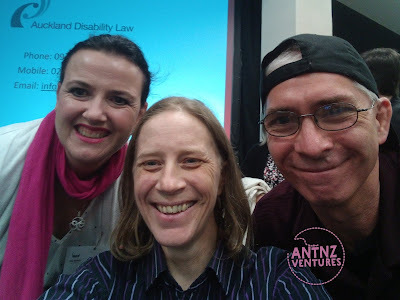 Antnz: Hey guys, Antnz from AntnzVentures here and I’m with David who is the organizer of Show Your Ability and I’ll just get him to say a bit what we’re doing and why he does it. David: Ah, we’ve been running now for 20 years and unbelievably it started in the days before the internet, when we just used to get calend.. um catalogues of actual bits of equipment and stuff like that and fundamentally we wanted to have a good play around and a tactile, you know, rattle and hum and.. ah… play..
Antnz: A bit of a play with the toys. David: Which have changed so much over the decades, and we can get more and more stuff. Antnz: I know, I had a bit of a play on the downhill bike that Melrose is starting to bring in now..
David: Yes certainly and from the point of view from the people who actually use the equipment (Antnz: yeah) so people are a lot more informed and not just have to take the word of whatever health professional they happen to be working with (Antnz: yup) and to have a lot more choice and ah, just, just be significantly more aware of all of the various options out there. 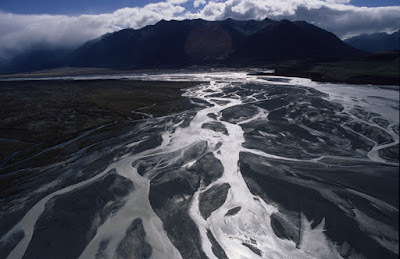 It’s always felt to me that New Zealand is in a really good position, in that we, um, a lot of the suppliers import a lot of the really choice stuff from around the world so we get a lot of the innovation (Antnz: yeah cool), and things like that but if you don’t get to see it, you don’t know it exists..
Antnz: Oh and that’s the thing for sure, I’m part of the Enabling Good Lives Regional Leadership team, and a lot of talk around that sort of thing is about choice and control and the fact that you’re running this to give more people more choice and control to give people more choice and control is awesome, so I want to thank you for running these sorts of events. 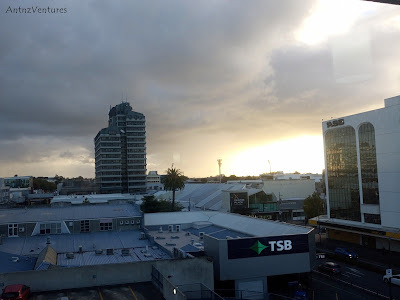 Um, I know here in the Manawatu we’ve got quite a large population of people with disability and to have the opportunity to come down and have a bit of a look at what’s available, um, is awesome, ‘cos I’ve seen some stuff today which I didn’t see a couple of years ago. Um, and I will be back next year, cos, um, with AntnzVentures and doing more with people with disability in the outdoors, um, I’ve definitely come away with some good ideas for running programs over the year. So, thanks for your time David, (David: cool) hope it all goes well for the rest of the day, and I hear… I think you’re headed to Christchurch next aren’t you? Antnz (off camera): So I was lucky, got to have a bit of a play on the Segway for wheelchair users. Fun piece of kit, really fun, um, and I can see that it could be really well utilized in the future for some of the stuff I do. Um, just had to keep an eye on the width, but that’s quite normal. Not sure how it would go for people with limited trunk function, but a good piece of kit indeed. Sitting with Brendon Stratton from RGK NZ and Lasher Sports. Antnz (off camera): So this is Brendon, he’s a bit like me and he breaks his gear, so I’m having a look at the RJ… ah… RGK range, um, box frame with an attachment for the front for my off-roading… and the other beast that Brendon has got here is behind him. I tried the Melrose one out before and that is front facing, whereas this is recumbent so I’m probably going to have a bit of a burn in that as well. Scene change to Antnz & Brendon with trike, Antnz loading into trike. Brendon: So jump in there… so usually we strap you in there but you probably won’t need it, it’s just to stop your feet bouncing out as you’re going downhill… so you won’t need it today I don’t imagine. Brendon: yeah that can be a dangerous thing… Righty-ho… You’re in a low gear at the moment, so flip around there like that. You’ve got your front brake is there (Antnz: yep) and your back brake is over here. This button here changes gear, it makes it go harder and faster (Antnz: yup), this one here, you’re in the easiest gear at the moment. You’ve got this pin here, so push that button in and remove that, push it in and pull it out and that releases the steering. And then it’s just basically it’s just like this, (Antnz: Yup) straight around. Ha ha ha… I’ll take the park brake off for you. Ah hahaha… (Antnz: mutters at Brendon) I’ll come with you if you like. MJ (off camera): What you didn’t go outside? Brendon: You wanna go outside? 7 minutes 58 sec: Brendon: I’m not even going to try and keep up with her aye. MJ (off camera): Mate, I don’t even bother anymore I just wait for her to come back. MJ (off camera): Laughing, Yeah that’s the one, I’m the one that cooks so she always comes back. MJ (off camera): C’mon, power up! 8 minutes 35 sec: Brendon: Take it up a curb somewhere; go this way. 8 minutes 49 secs: MJ (off camera): Does it have a higher gear? Antnz: Oh there he is. Brendon: Take it up and get a feel for it, up, so go through that gap there, and come down through, um, so go through there. Normally we’d set it up for, depending on weight, how heavy you are, and you’d adjust the suspension so, you don’t feel the movement underneath you. 9 minutes 47 secs, Antnz: Any traffic coming? Brendon (off camera): No, you’re good. Brendon: Nice and smooth aye? Antnz: I wonder if they’ll open those doors for us? Brendon: And with the power assist it would be even better. Antnz: So, it puts the power through the crank rather than through the gearing. Brendon: It puts it through the crank then it goes through to your, your cassette then onto your wheel. The major difference is that you get a lot cleaner power delivery (Antnz: Yep) and you get a lot more torque. So you’ve essentially got the power of this plus, combined with the gearing you have available on the actual bike as well. Antnz: So that would make quite a bit off difference for doing hill stuff as well aye? Brendon: Oh 100%, you get a lot, cos it’s a lot more linear power, so the power is more progressive, because you can control some of it you don’t need to put, or change up or increase or decrease the power, (Antnz: Nice) because you can increase or decrease the.. (Antnz: the gears) through the gearing. So you get a more smoother transition, and you get a lot more momentum. The biggest thing with mountain biking whether it’s, whether you’re doing seated, hand cycle mountain biking or 2 wheel, able bodied is you want to maintain momentum (Antnz: yeah for sure) and the best way to do that is to get the right gearing. (Antnz: Yup) And then get the assistance you need so you can maintain the peddling, that’s the main thing. Antnz: So I’ve had a pretty good look around, um, heaps of different chairs around here, um, just packs of chairs, um, quite a few bikes and things like that, a lot of bathroom and bedding equipment. Um, one thing I’ve been really disappointed about is there’s not a lot of crutches and not a lot of things for those of us who are wobbly walkers or aren’t full time chair users. Um, what I have seen though has been really cool for AntnzVentures stuff in the future, is a portable, fully accessible bathroom unit that you can hire. Um, so that’s making a lot of possibilities open up for AntnzVentures in the future, so I’d say stick around! Antnz: Hey everybody, Antnz here, I’m home after Show Your Ability. Really good expo, um, heaps on offer, like the range of chairs you can get these days is just insane, absolutely insane. Um, heaps and heap of chair, a lot of seating options, um,a lot of things like bathroom slings. Some really cool innovations coming out. Um, one piece of gear I thought was similar to a, um, a scoop rescue stretcher, um, but it can get somebody from lying on the floor to a standing position for transfer in about one and a half minutes. So I thought that was pretty cool. Um, heaps of gear on offer, I had a bit of a play on a couple of mountain bike options that are available these days. So much fun, so much fun! Um, possible super dangerous at times and who knows, in the future I may look at getting one, but that will be well in the future as I have other plans, um, but yeah, load of fun and if I had the money I would go and get one now. Um, *clears throat* was a little bit disappointed that there weren’t a lot of options for wobbly walkers. Um, asked around a few people around the Sidestix that I’ve been eyeing up from the states and ended up actually finding the New Zealand supplier. Um, so I’ll be looking into how to go about getting some of them, um, coming up. Um, heaps of gear, lots of different, um, like bathroom options and slings for transfer. Um, like I said before, heaps of chair, heaps and heaps of chairs. Um, right through from, um, day-chairs, um, to the tracked off road chair, um, that Speedy Snail Mobility got. Um, met some cool people, bumped into a few people I hadn’t seen in a while and had a catch up, um, but I needed to come home and have some food ‘cos I was hungry and I’m sorry Scott that I couldn’t be there to support you talking to the providers around, um, System Transformation but I was starting to get hangry and I don’t think calling them muppets would have been appropriate in that setting. Um, so I hope that your talk with them went well. Um, really cool to see some of the innovations out there, given me some ideas for AntnzVentures in the future. Um, if you can get to the ones in Christchurch and Dunedin if you haven’t been to one before. If not, make sure you go along to one next year ‘cos there is a ton of change in those expos every year. Um, and yeah, it’s really cool too see the expos expanding and David you’re doing an awesome job and keep it up, and I’ll see you next year. Um, everybody else, go along have a look because there’ll be stuff there that can help you thrive rather than just survive. Take care, talk to you soon.